This story continues the experiences of the Little Pilgrim. She feels happy and blessed in the Afterlife, but cannot forget those she loves on Earth; and does not understand why there should be people in pain and trouble when God could so easily mend everything. A "sage" accompanies her back to Earth for one last visit, that she might better understand God's plan. They visit many people in great trouble, some of them dear friends of the Little Pilgrim. The first people they visit, a mother and father with their dying son, were based on Frank and Sara Tarver, Margaret Oliphant's dear friends in Windsor, whose son Wladimir died in 1883 at age ten. 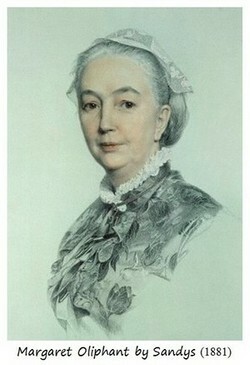 Sara was the daughter of Mrs Oliphant's very close friends John and Jane Tulloch of Saint Andrews. The second person they visit, a troubled woman walking down to the beach, is Margaret Oliphant herself; and the epiphany described in this story really happened to her while staying at Saint Andrews in 1884. (Per The Autobiography of Margaret Oliphant - the Complete Text, 1990, edited by Elisabeth Jay, pages 52-53 and 157.) There is a markedly similar scene in the novel Lady Car (1889). It is likely that the third person they visit, a man who has been out drinking and carousing all night, is based on Margaret Oliphant's son Cyril, who was an alcoholic. The story's first paragraph, as published in The Scottish Church magazine, was omitted from the book version.